Friends of Scouting is an opportunity for families, friends, alumni, businesses and community organizations to support Scouting. The $33 registration fee goes directly to the national office of the Boy Scouts of America. 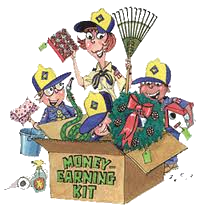 If a Scout unit collects dues, that money stays with the unit to help pay for supplies, advancements and other activities. None of that money helps the Sam Houston Area Council. In order to keep Scouting affordable for all youth, the council runs an annual Friends of Scouting fundraising campaign. Friends of Scouting contributions provide approximately 24% of the support the council receives each year. The success of Scouting depends on those who support it. Please help Scouting provide the resources necessary to make sure every youth can benefit from Scouting’s fun, exciting, adventure-filled activities that foster character, honesty, respect and life-long values. Unit Leaders: Each unit is requested to hold an FOS presentation at your unit’s biggest gathering (typically the blue and gold banquet or a troop court of honor) during the months of February through May. The presentation, which takes approximately seven minutes to conduct, informs parents and leaders of all council services, its financial needs and extends an opportunity to help fulfill the need. Please sign up for a presentation. Increase your unit and council income – 70% stays in your unit and the local council. There are loads of incentives: $600 club and college scholarships. For additional revenue, sell online to friends and family out of town. Scout Fair coupon books are a brilliant way for units to raise money and prepare Scouts to earn their own way! 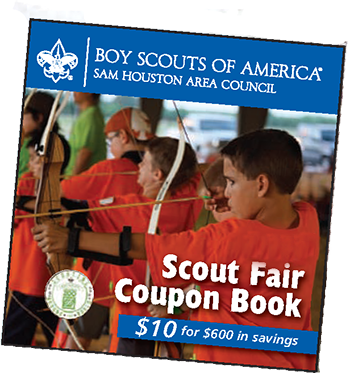 The Scout Fair coupon book offers great savings for the buyer, while Scouts earn commissions for every $10 coupon book purchased. Buyers support the Scouting program, while receiving over $600 in valuable savings from partners such as Kroger, Sonic, Bass Pro, Goodyear and more. All units receive a 30% base commission for each $10 Scout Fair coupon book sold, for funds turned in on or before Scout Fair. Participate at Scout Fair, as either a service unit or booth participant, and earn an additional 10% commission. Service units must have a minimum of 50% of their registered youth participating to receive the additional commission. Units can also take advantage of early bird turn-in dates, offering 5%, 3% and 1% additional bonus commissions based on when monies are turned in to council. In addition, Scouts qualify for prizes once they sell 15 coupon books. A unit must submit a Unit Money-Earning Application at least two weeks prior to committing to any fundraiser. 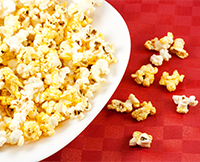 Applications are not required for SHAC popcorn sales or Scout Fair coupon book sales. Whenever your unit is planning a money-earning project, refer to the BSA's "Guide to Unit Money Earning Projects." Understanding money earning guidelines will help you in the selection of your project. Money earning projects help youth learn to pay their way. All projects (except SHAC popcorn sales and Scout Fair coupon book sales) must be approved. Many corporations match employee contributions made to the Boy Scouts of America. Some companies even make financial contributions for volunteering time to Scouting. Numerous local companies recognize volunteer time through the donation of cash grants to non-profits in which their employees volunteer. This means that for each hour of volunteer time, employers donate funds to support the Sam Houston Area Council, Boy Scouts of America. Volunteer time is money with volunteer grants. The Sam Houston Area Council hosts seven special events throughout the year to fund various Scouting programs and to recognize the outstanding individuals that provide those programs including the Sporting Clays Tournament, New Eagle Scout Reception, Corporate Dodgeball Challenge, Distinguished Citizen Award Dinner, Celebrating Cultures and the Top Golf Challenge. For additional information or questions about finance, contact the district finance chair or district executive.